This Leapers SCP3-M3124AOMD-A UTG 30mm SWAT 3-12X44 Compact Scope is rainproof, fogproof and shockproof and includes a sniper sunshade and flip open lens caps. 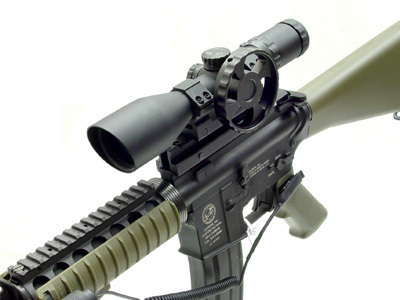 This is a great scope for Remington 700, 7600, AR15, M4, M16, AK47/AK74, SKS tactical rifle and more. UTG 3-12X44 30mm SWAT Mini Size Range Estimating Mil-Dot It Has 30mm Tube for Maximum Light Transmission and Wider Windage/Elevation Adjustment. Zero locking never fear loosing zero from accidental or from non accidental bumping, Zero resetting, re-align the dial for easy reading wthout affecting Zero. Unique Dual View Design, providing 12% extra Field of View(FOV)at high powers than other similar products on the market. Most scopes use one common FOV Definition between low and high powers, resulting in a smaller, compromised FOV under high powers. Our unique Dual View System adjusts its optical definitions to create an optimally enlarged FOV as power changes to above 6X. Side Wheel Parallax Adjustment - New, convenient and user friendly feature, allowing for easy and precise objective adjustment - FROM 10 YARDS TO INFINITY. Target Turrets with Larger and Consistent Windage/Elevation Adjustment Range- EXCEEDS 30 MOA IN EACH DIRECTION. Comes Complete with sun shade and flip-open lens caps. Deluxe Add-on Swat Wheel for Side Wheel Adjustable Turret Not included But Available Item #SCP-SW080LP Make a Great addition to this already incredible Swat Scope.